be happening, and I'm sure some of you in the active and reserve forces have heard similar. occasionally see it on various bases even for those not deploying. making statements that all hands would be in OCP by 2019. (Which is a reasonable timeline for a recommendation made this FY). As of writing this the FY2017 Uniform board's recommendations have not been made public. some are not excited about the idea of many patches coming back to the USAF. which would top the new list of "typical CAP". When will CAP authorize OCP for its members? There are some AFSC's CONUS that wear OCP's daily. Some of these are EOD, SF (currently only missle cops), CCT/PJ, JTAC, TAACP, and I have heard those assigned to AFSOC (nothing than hearsay on that). So yes there are some members of the AF who wear OCPs on a daily basis CONUS. Personally, I can care less I am on the down hill slope to retirement and wont matter much to me anyway. I saw an Army Staff Sergeant wearing them in McDonalds a couple of weeks ago. Not sure if he was AD or Guard, but I'm going to guess Guard because Michigan has no active duty military facilities to my knowledge, except for USCG. All others are reserve component of some kind; ie Camp Grayling and Selfridge ANGB. 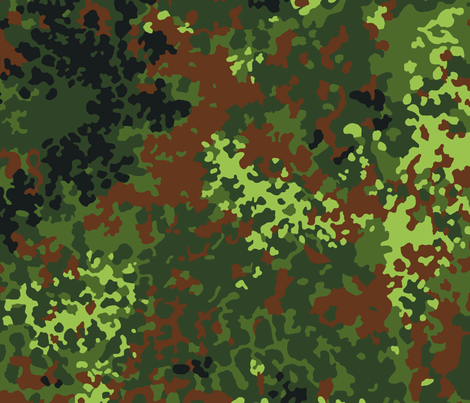 They actually remind me of the Flecktarn camouflage worn by the German Bundeswehr except the colours aren't as vivid. Whaddaya mean I ain't kind? I'm just not YOUR kind! Ex-CAP Captain, now CG Auxiliary, but still feel a great deal of affection for the many good people in CAP. 820th is wearing them CONUS. It's possible that's because it's easier for the unit to replace if they get trashed in the field. At least that's why we wore DCUs stateside back in the day. I assume CRGs are as well but I'm not sure. I think Desert Defender cadre may have them going by their Facebook page. I think they're coming and within the next 2-3 years. CRGs are not wearing OCPs CONUS. And as stated before some AFSCs are but the AF as a whole are not. There are already issues with obtaining them so they will not be coming AF wide anytime soon. The units that work with the Army on a daily basis seem to be the one's wearing the OCP stateside. Of course they were the ones who wore the ACU too. I was headed up to encampment graduation this morning, stopped at the local truck fuel place to get gas, and one of the units from an armory up north was headed out for AT and stopped for potty / fuel. 50/50 mix of soldiers in ACU and OCP. The army is definitely on it's way to OCP, ACU is out. My money is that AF is transitioning pretty consistent with Eclipse’s timeline based on the rumor mills I hear, and CAP will get a hefty stock of surplus ABUs and will not be authorized to transition to OCP. Of course you would be hard pressed to provide a realistic need for the Air Force to be in camouflage in the first place, at least in CONUS. When you deploy it's a different story, but that's why you have Deployment Bags. But in CONUS the Air Force could easily do it's job in Blue BDU's. Since you haven't detected the pattern: right about the time USAF transitions to something else. "Amateurs train until they get it right; Professionals train until they cannot get it wrong. " This actually mirrors my thoughts about the Navy's version of a camouflage uniform for work aboard ships. While I do understand some of the "whys and wherefores" (stains from oils, etc., don't show up as much), I've never been able to wrap my head around why the Navy would choose a BLUE camouflage uniform. I mean, if you fall overboard, don't you WANT somebody to see you?? My former sq commander's wife is a new Navy ensign. She started her Navy career in the blue camo less than a year ago. And she's a surface warfare officer, not a snipe or some on-shore duty. Ohh, I know the pattern. I was just introducing the topic that half of those posting about uniforms and uniform changes ends asking about. They are the ones that do not know the pattern. I guess I just keep it simple. Wear the Dark Navy BDU's and go on. I could care less about which Camo pattern they choose. What is this common-sense posting you're bringing in here? You must be new. Hi Zippity, that got me to laughing. Yes I have been in CAP for a year but am an old Air Force veteran from the Vietnam era. I guess which Camo pattern is going to be authorized for CAP wear is important to some folks but I just found it simpler and more economical to narrow the choices of uniforms to the basics. Maybe my age has something to do with as I will be 70 in December and I don't sweat this kind of stuff. I thought the 1505 and 1549 uniforms back in the day were fine and comfortable but eventually the Air Force phased them out for something new and better. I actually prefer having cadets in ABUs. It makes them easier to spot.